The uLog is a tiny analog logging device. 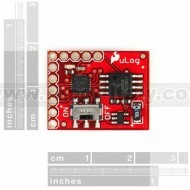 Central to the logger is an ATtiny24 mated with an AT45DB161D 16Mbit flash IC. Sampling at 50Hz, it’ll log 3 channels of 10-bit ADC for about 2 hours before the memory fills up. Very stripped down and simple to use: at power up it determines if a UART line is attached. If there is, it spits out a “?” and waits for user input. There are only 2 commands: “r” for read and “e” for erase. Erasing the flash sets all addresses to 0xFFFF, and reading dumps all the data up to the first 0xFFFF. If there’s no UART line attached it starts sampling. If connecting with one of our FT232 breakout boards, all you need is TX, RX and ground. If using an RS232 shifter board you will also need to connect 3.3V. The power input is a 2-pin JST connector, which works well with our LiPo batteries, especially the small 100mAh LiPo, and it draws just 4mA with an ADXL320 attached. An ON/OFF switch is also included. There are so many uses for this device! We strapped it to a rocketwhile it logged the analog output of an ADXL321 accelerometer.